When you see something that makes you laugh, you always cover your mouth to hide your damaged smile. You’re aware that it looks flawed and incomplete and are conscious about letting people see it. Why keep yourself from enjoying the small pleasures in life because of your smile? Read about the benefits of dental crowns in Leawood and how they can give you newfound confidence. Crowns are a cap that fits over your damaged tooth or can replace a missing tooth. They’re crafted from durable materials that can withstand the tasks that your natural teeth would. They offer more support than porcelain veneers and protection against further tooth decay. Because they are placed over the top of your teeth, they seal them off from bacteria and saliva and helps to preserve your smile. How do I Know if a Dental Crown is Right for Me? Crowns can be a possible solution for your tooth restoration They can cover and protect teeth that are broken, decayed or discolored. 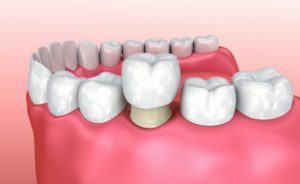 If you’re looking into dental implants to replace a missing tooth, you can anchor a crown to the top of the post that is placed in your jaw bone to provide you with a new tooth. After you receive a root canal, you can save your freshly repaired tooth with a crown. Not only will it make it look better, but it will protect it from bacteria getting into it again. Because they are mostly molded out of porcelain, they are able to replicate the look of your natural tooth. No one will be able to look at your smile and tell it’s not 100% real! When you lose a tooth, your ability to chew is affected. With a dental crown, you won’t have to suffer from a weak bite because of the strength of the crown. Crowns cap your teeth to help protect the existing tooth from becoming infected. With so many benefits to offer you, it’s no wonder why you would schedule your dentist appointment to speak about your options! You can repair your smile and gain your self-confidence back by considering crowns as a restorative solution. Dr. Dennis Ayer welcomes individual patients and entire families to his practice so they can receive the quality care that they deserve. With a focus on cosmetic and restorative dentistry, he’s your one-stop-shop for everything from your semi-annual checkup and cleaning to your dental implants. Visit the comfortable and warm environment that he’s created so you can leave with a healthy smile! For questions or to schedule an appointment, contact 913-686-9097 or visit our website.